Azimut Benetti has arranged the 11th edition of its exclusive Yachting Gala in Porto Monopoli, Italy. 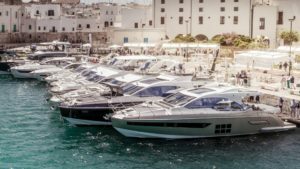 The yachting gala brought together international owners who had the chance to view Azimut latest collection of Flybridge 66, S7, Grande 27 Metri and the new Azimut S6, which will make its official debut in September at the Cannes Yachting Festival. The company also showcased other models in the Azimut and Benetti ranges with a total of 14 yachts. On the occasion of the event, several entertainments were staged: sea trials, seabob racing, exhibitions of jewellery and clothing from the most prestigious Italian designers, live shows by master tailors and signature shoemakers, and much more. A rich lunch serving all the finest local specialities for a real feast of flavours was followed by the opportunity for owners to discover Monopoli’s secrets and admire the reefs of Polignano a Mare. The piazza and typical streets of Borgo Egnazia were later the settings for the gala dinner on Saturday. The gastronomic experience culminated in the Festa del Borgo – an exciting tribute to the region’s festivals that transformed the main square into a theatre of folk music and dance sure to engage and involve everyone present. Doing the honours were Paolo and Giovanna Vitelli, respectively Founder-President and Vice President of the Azimut|Benetti Group. For years now, Dubai, and the Middle East, in general, have been an important market for Azimut Yachts. Owners in this region are particularly fond of the Grande Collection, with 30% of the yachts in this line sold in the Middle East, where the brand’s turnover has tripled in the last five years. Azimut’s commercial success is also confirmed by the short-term delivery plan, according to which one yacht a month is scheduled to arrive in the Middle East in the second half of the year.